In 1885 Major (later Major General) Joseph Maria Gordon, the first commander at Fort Glanville, designed a trophy to symbolise the military skill of defence. It consisted of a series of bayonets radiating out in a semi-circle from a crown. Commander (later Vice Admiral) William Rooke Creswell, commandant of the naval forces of South Australia and Commanding Officer of Her Majesty’s Colonial ship “Protector” then undertook to have the trophy made. Major General Sir Edward Hutton, the newly appointed first Commander-in-Chief of the Australian Forces used this trophy as his inspiration when he requested a General Service Badge to be worn by the Australian soldiers in South Africa. So it was that in 1902 the first rising sun badges were worn with pride by the troopers of 1st Battalion Australian Commonwealth Horse, which was raised after Federation. Proudly worn in two world wars, the rising sun, officially known as the General Service Badge of the Imperial Forces, became one of the best recognised and honoured insignia of the allied armies. An integral part of the digger tradition, its distinctive shape, worn on the upturned brim of a slouch hat is readily identified with the spirit of ANZAC. The Fovant Badges Society acknowledges with gratitude the support of the Australian Department of Veterans’ Affairs (DVA). 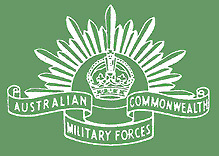 DVA, via its Overseas Privately Constructed Memorial Restoration Program, provides an annual grant for the preservation of the Australian Imperial Forces badge (now known as the Australian Commonwealth Military Force badge).